Females have deeper bodies than the more slender males. A peaceful community fish that is best kept in shoals of 6 or more which will do well with other peaceful community fish of similar size. Do not keep with larger predatory fish such as Angelfish. Will accept most foods including pellet and flake as well as occasional live/frozen food such as bloodworm and daphnia. Does best in a spacious tank with open swimming space as well as hiding places. Needs acidic water and do not appreciate very bright lighting. 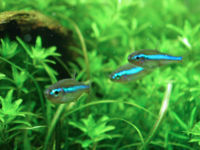 This little fish has an identical body shape to the Neon Tetra and Cardinal Tetra, the significant being the complete lack of any red colouring but the presence of the lateral iridescent blue line.